"-a ladder workout is an interval session where you either ascend or descend the time or distance—along with the pace—of each repetition. “Ladder workouts that start with shorter, faster intervals flood the legs with lactic acid and teach your body how to persist with fast running even though they are tired and heavy. Descending ladder workouts that decrease in interval length throughout the workout—but increase in pace—teach your body how to change gears late in a session.” -Coach Sarah Crouch of Runners Connect. MY COMMENT: As Coach Crouch points out, there are different reasons why you might start with shorter intervals as opposed to working your way down from longer segments. 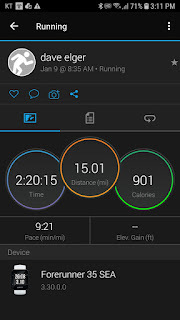 While I favor multiple repetitions run at the same distance, occasionally I will break it up with a ladder routine- working my way up to finish at a pace that simulates racing. 3 runs 10 miles or longer! Sun: Rare day off! Legs feeling just a little too beat up in the morning. Today I ran a hard 5K just to evaluate how this 80-20 program is working. The last few hard workouts I've done has been either on a 10 lap indoor track or trail so splits are always slow. I've run several 5K time trials on a straight bike trail with 3 small inclines- 1 in the first mile and 2 in the second mile. Today I tied my PR on this trail with negative splits. 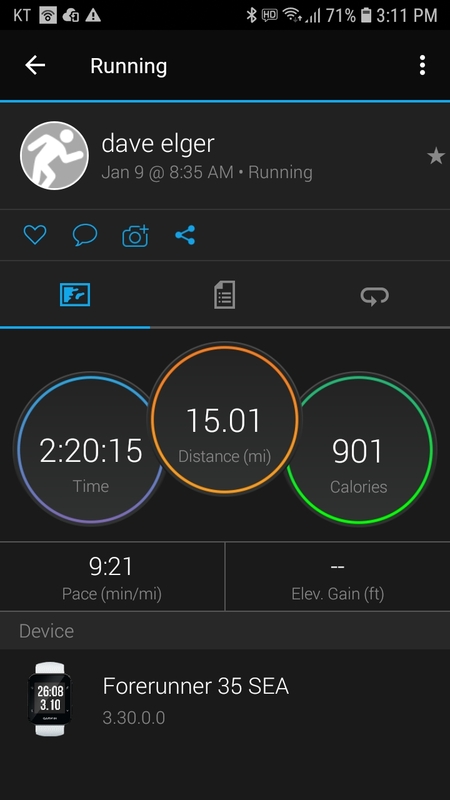 I've been experimenting with a very slow pace on most training runs (9 min pace or slower) trying to conserve legs for the hard days while at the same time slowly extending longer runs (15 miles on Wed, 8 on Thursday). So far so good. Tom "Tinman" Schwartz is fast becoming recognized as one of the most successful distance running coaches in the U.S. today. From recently crowned USA Marathon Champion Brogan Austin to former high school sub 4 minute miler Drew Hunter (not to mention capturing the USATF National Club XC Championship team title the last 2 years! ), Tinman's coaching principles seem to be work across the spectrum of distance running. Check out this Final Surge podcast to learn more about Tinman's unique yet down to earth coaching philosophy. MY COMMENT: We all should be doing some of these on a regular basis. Thanks Ben! Not long ago I began to notice what looks like the start of Tailor's Bunion and have become obsessed with researching the use of toe spreaders. One of the best resources I found is Northwest Foot & Ankle that has created a number of excellent videos illustrating new, conservative methods for treating many common running related injuries. Comments: Feeling some hamstring/ hip pain that I am hoping to push through. Lots of piriformis stretching and laying off the hamstrings for a while. 13:00/mile is your current potential for a very hard pace in a marathon. COMMENT: I'm a fan of these prediction formulas. While they may not be accurate for every runner, more often than not you'll be able to make an adjustment to the formula to make it fit.